Lineage. Organized as 112 Aero Squadron on 18 Aug 1917. Redesignated: 633 Aero Supply Squadron on 1 Feb 1918. Demobilized on 19 Aug 1919. Reconstituted and consolidated (1936) with ‘112 Observation Squadron which, having been allotted to Ohio National Guard, was activated on 20 Jun 1927. Ordered to active service on 25 Nov 1940. 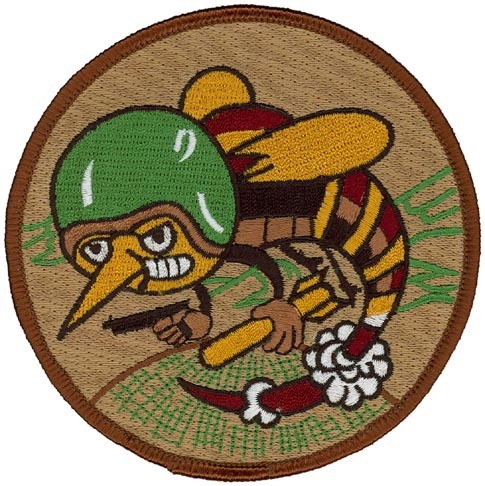 Redesignated as: 112 Observation Squadron (Light) on 13 Jan 1942; 112 Observation Squadron on 4 Jul 1942. Inactivated on 18 Oct 1942. Redesignated 112 Liaison Squadron on 2 Apr 1943. Activated on 30 Apr 1943. Inactivated on 7 Nov 1945. Redesignated 112 Bombardment Squadron (Light), and allotted to Ohio Air National Guard on 24 May 1946. Extended federal recognition as 112 Bombardment Squadron (Light) on 2 Dec 1946. Redesignated: 112 Fighter Bomber Squadron on 9 Jul 1952; 112 Fighter Interceptor Squadron in Jul 1955; 112 Tactical Fighter Squadron on 20 Aug 1962; 112 Fighter Squadron on 15 Mar 1992-. Assignments. Unknown, 1917–1919; Ohio National Guard (divisional aviation, 37th Division), 20 Jun 1927; Fourth Corps Area, 25 November 1940; I Army Corps, Dec 1940; 65 Observation Group, 1 Sep 1941-18 Oct 1942; 10 Reconnaissance Group, 30 Apr 1943; II Air Support Command (later II Tactical Air Division), 11 August 1943; III (later I) Tactical Air Division, 1 Jan 1944; United States Strategic Air Forces in Europe, 4 Jun 1944; Ninth Air Force, 7 Jun 1944; (Attached principally to Headquarters Command, Supreme Headquarters Allied Expeditionary Forces, 7 June 1944-14 July 1945, but with elements attached to Headquarters Command, European Theater of Operations, US Army, or sections thereof, 7 June-1 November 1944, 15 November 1944-12 February 1945); US Forces, European Theater, 10 Aug 1945; Third Air Force, 5 Sep-7 Nov 1945. 180 Tactical Fighter Group 15 Oct 1962; 180 Fighter Group, 15 Mar 1992; 180 Fighter Wing, Oct 1995-. Stations. Kelly Field, TX, 18 Aug 1917-19 Aug 1919; Cleveland Aprt, OH, 20 Jun 1927; Pope Field, NC, 2 Dec 1940; Dover Field, DE, 29 Dec 1941; Georgetown Aprt, SC, 21 May 1942; Lantana Aprt, FL, 30 Aug 1942; Birmingham Aprt, AL, 18 Oct 1942; Salinas AAB, CA, 30 Apr 1943; Redmond AAF, OR, c. 19 Aug 1943; (operated from Camp Abbot, OR); Corvallis AAF, OR, 6 Nov 1943; Portland AAB, OR, 24 Apr-18 May 1944; RAF Kingston Deverill, England, 9 Jun 1944; RAF Hurst Park, England, 20 Jun 1944; RAF Heston, England, 30 Jun 1944; (detachment at Valognes, France, c. 6 Aug-c. 9 Sep 1944); Jullouville, France, 27 Aug 1944; Buc, France, 24 Sep 1944; (flight operated from Namur, Belgium, 26 Oct 1944-c. 11 Feb 1945); Frankfurt-am-Main, Germany, 21 Jun- Aug 1945; Drew Field, FL, 5 Sep-7 Nov 1945. Cleveland MAP, OH, 2 Dec 1946; Lawson AFB, GA, 10 Oct 1950; Berea, OH, 9 Jul 1952; Akron-Canton MAP, OH, Oct 1952; Toledo MAP, OH, Apr 1955-. Operations. Evidently a supply unit, 1917–1919. Emergency operations while under state control included flood-relief in Ohio Valley during latter 1930’s. Antisubmarine patrols, 12 Jan-c. Oct 1942; courier in area to rear of front lines, Jun 1944-May 1945. Called to active duty for Korean War call-up. Called to active duty as part of the Berlin Crisis call-up, but remained in Toledo. Participated in: Operation Just Cause, 1989. Operation Desert Shield and Operation Desert Storm , 1990–1991; Operation Provide Comfort, 1994, 1996; Operation Northern Watch and Operation Southern Watch, 1999, 2000, 2001, 2002. Operation Iraqi Freedom, 2005; Operation Enduring Freedom, 2005, 2007. Air Sovereignty Alert (ASA) mission as part of Operation Noble Eagle will aid in the protection of the Continental United States and Canada under the direction of 1st Air Force and North American Air Defense Command. Campaign Streamers. Antisubmarine, American Theater; Northern France; Rhineland; Central Europe. Emblem. Approved 9 Mar 1954.